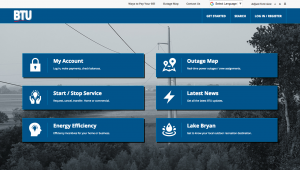 Bryan Texas Utilities (BTU) introduced a new look and feel to their website this week, designed to improve efficiency and ease of use for their more than 58,000 customers. In addition to the features customers have become accustomed to, such as making an online payment, starting and stopping service, and accessing the outage map, they can now enjoy an “app-like” mobile experience that puts all of these options easily at their fingertips. Customers can also access past editions of Texas Co-Op Magazine, the monthly bill insert, and reports and financials, as well as apply for rebates, view their consumption history, and learn more about BTU sponsored activities and programs. Visit btutilities.com to view the new site and follow them on Facebook (@BryanTexasUtilities) and Twitter (@BTU_BryanTX) for news and updates.